Katie's adventures as she serves the Lord and the people in CA for the next 18 months! Last Monday was my Miracle Monday!” I think I’ve already told you all; Sister Treadwell broke her tailbone (or so we thought) from me pushing her down the stairs after getting mad at her a few weeks ago……….JUST KIDDING. I didn’t push her :) But really about the whole tailbone thing. So Monday night we had setup an FHE (Family Home Evening) with one of the families in the ward and while shopping they called and cancelled and we were super bummed..Well we go to dinner at this single womans house and she had ended up inviting all of her family over to join, which was a MIRACLE because ½ way through dinner I look at Treadwell and she’s in tears…homegirl NEVER lets people see her cry. So I knew she was reallllly in a lot of pain. Because this sweet woman had invited her family over we were able to stop everything and go in the living room to watch 2 priesthood holders give her a blessing of healing and comfort. Because the family had cancelled FHE with us we were able to go home and let her get the rest she needed instead of worrying about letting them down by having to call and say we couldn’t go anymore. Literally everything worked out the way it needed to and it was amazing to see that the Lord already knew earlier that afternoon that Treadwell would have that happen and he provided a way, as always. 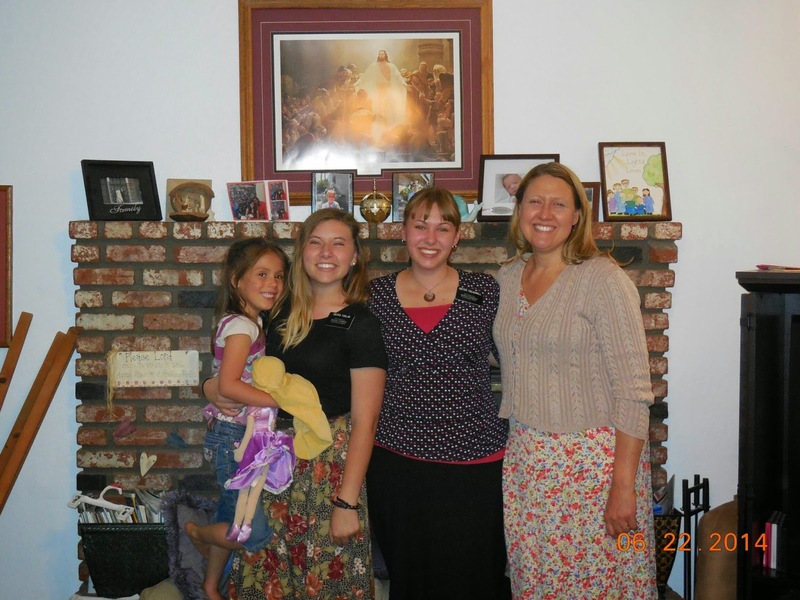 I left there knowing that I want to do everything in my power to always have the priesthood in my home, so that when needed, I could call upon it. I am thankful for worthy priesthood holders and I know for a fact that I want to be sealed in the temple for time and all eternity with someone who understands the importance of that. On the bright side of things we went to Urgent Care on Tuesday and found out her tailbone is NOT broken and they gave her drugs to help with all the pain. Bad news? The pains hit her the wrong way Tuesday night and she almost passed out. I sat with her on the ground for an hour fanning her….my arm is still sore…hahah. If anything, Sister Treadwell has helped me, through all the injuries, how to be a good mom someday hahah. This week I have reflected on the words of my wise parents who would tell me “You don’t get rewarded for bad behavior” every time I did something wrong. I see my Heavenly Father giving me the same council as my earthly parents. I think some of us are under the assumption that we can just do whatever we want to with our lives because it doesn’t matter anyways #yolo. That we can just come here to this earth and live the way we want to live, and as long as we BELIEVE in God that we will be saved and blessed. But we are so wrong if we truly believe that. “Ye are eternally indebted to your Heavenly Father Mosiah 2:3” Heavenly Father not only ISN’T going to bless us for doing wrong, but CANNOT bless us when we are doing wrong. He expects us to be big girls and boys like we think we are and make correct choices for ourselves. To stand up and do what’s right even though it isn’t the most popular thing. To live our lives in harmony to His son, Our Saviors life. We just aren’t going to get rewarded for bad behavior. And I don’t know about you, but I don’t want to have to stand before Him some day and be scared because I know I lived a horrible life. I want to stand before Him, in all confidence that I strived to be like Him here on the earth, that I took advantage of the atonement and repented when I needed to (which Is every single day) and that I came and accomplished all that He knew I could. We can’t just do whatever and expect to be happy. Making Christ the center of our lives and making good decisions will ALWAYS make us happy. End of discussion. This is to everyone (well, my blogs are always to everyone hahah but you know what I mean). Idk if yall remember David Archuleta or not but this is an incredible interview with him about his mission. -Woodys 70th birthday was this week so we made him a cake and he was SO excited..he also called us his adopted daughters which was THE best feeling ever. Made me feel like I was doing something right. -Ate dinner at a members house who own a pet pig…hm. Yeah. It was awesome haha. Since being here in Hesperia I’ve made a new friend at Winco. He works in the produce section and every time we are there we talk and have a jolly ole’ time. Well anyways, last week while we were talking he looks at Sister Treadwell and I and goes “ yall must be really close. I always see a lot of missionaries come in here, but yall are ALWAYS together. Yall must be like the best of friends!! !” We walked away and jokingly talked about how funny it’s that people ACTUALLY think we like each other and how good of actors we must be :p hahhaha. It was really funny. Little does he know we spend ever waking second together as companions hah. Lunch with the STL's: My leg cramped up and Sister Cook was there to save the day...Sister Price...was there to photo bomb! I want to start by saying thank you to all of you. Thank you for all the emails, letters, packages, kind words, prayers, everything. This week was one of the worst ones I’ve had in a while (so it seems) but it seemed like I received more love from you all than ever too. It’s just a testimony to me that the Lord knows my every need. He knows when I’m struggling regardless of how I seem to be holding up. I should’ve said this a long time ago anyways. I know plenty of missionaries who get ZERO support from anyone, but here I am every week not having enough time to get back to everyone because of all the support. I am truly blessed. I’m not really sure why I am so lucky, but I do know that I love you all. Thank you. Thank you thank you thank you. 50 And I said unto them: If God had commanded me to do all things I could do them. If he should command me that I should say unto this water, be thou earth, it should be earth; and if I should say it, it would be done. 51 And now, if the Lord has such great power, and has wrought so many miracles among the children of men, how is it that he cannot instruct me, that I should build a ship? The Lord will never give us things we can’t handle, maybe they are things we can’t handle with HIS help, but they are never things we can’t handle. The Lord trust us. He sees our potential. He sees how incredible we can be and already are. 3 things that Hesperia has an excessive amount of?? Pawn Shops, Doughnut Shops, and Liquor Stores. There is one of all these on every single street I feel like hahha. I was messing around with Sister Treadwell saying one Pday we should go to every doughnut shop and get a glazed doughnut then decide which place is the best….too bad we would enjoy that a liiiiiiiiiiitle too much…hahha. 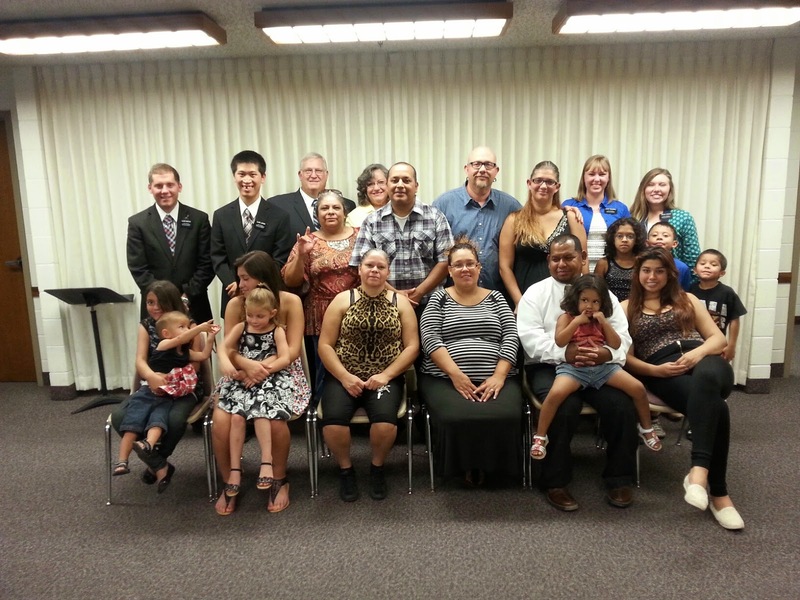 Speaking of elders….this week was rough partially because of elders. I sat back one night and thought to myself “how in the WORLD does Heavenly Father expect me to marry one of these fools some day?? ?” But then I realized why boys in the church are expected, not required, to go on missions. They need it. Just as much, if not WAAAAAAAAY more than us sisters do lol. Missions change lives. Random igloo house in the dadgum Desert! Who knew saving cats would be part of serving The Lord? WARNING: THIS BLOG POST INCLUDES A SEMI DISTRUBING PICTURE OF AN ANIMAL. JUST LETTIN’ YALL KNOW AHEAD OF TIME! I am amazed at how much better my past two weeks here have been since I’ve realized that I just get so wrapped up in things that I literally cannot change and when I just trust in the Lord and lean on Him to help pull me through all the chaos I am happy. I am thankful for the humbling, growing and spiritually rewarding experiences I continue to have on my mission. Monday: It was hot as fire out and we had a missionary cookout at the park. I was sweatin’ bullets!!! It was a really nice day though and just when we thought it couldn’t get any better the STL (Sister Training Leaders) Sister Cook & Price called asking if they could come crash at our apartment for the night because theirs smelt like fumes hahah. So OBVIOUSLY you know we haaaaad to pull our mattresses out into the living room and have a huge sleep over :P it was a blast. I really love those girls. Tuesday: We are sitting there studying our scriptures and such when all of the sudden Sister Treadwell FREAKS OUTS. She runs outside and low and behold there was a cat who’s foot was stuck in the wood post of our fence dangling there, trying to save his life. It was so sad. He kept trying to get up on the fence but then would fall back down and twist his leg around even more. It took animal control 45 mins to get there…they live like right behind us -_- but anyways, good news: they freed him, he didn’t even have a broken leg and the church is still true. It was a traumatic morning watching all of that go down. Whew. Pool Fireball (We named him)! Then we went to Zone Meeting and had to present our “training” on prayer. It was totally inspired for the Zone Leaders to ask us to do this. I, in specific, needed it. I thought about how if I was told I was going to get to call home today I wouldn’t just be like “yeah, this happened and it was nice, but yeah you know what I mean” I would go into detailed about it ALL. We have the opportunity to communicate with our Heavenly Father at any given moment and yet we take it so lightly and don’t actually tell Him whats on our mind. He gets the most condensed version of our convos when he should be getting the most detailed. "My words fly up, my thoughts remain below: Words without thoughts never to heaven go. "- Hamalet. I also knew from preparing this training that I had been getting lazy with my prayers. Especially at night. Instead on kneeling in prayer like I knew I should be I would lay in my bed and usually I’d fall asleep mid prayer (go figure). Mostly because I’m so tired by the time I go to say my prayers that I’d rather be laying down preparing my body for sleep since it takes forever for me to fall asleep…well guess what? Since then I’ve made it a goal to say my bedtime prayer on my knees and I’ve literally slept better this week than I ever have. I see the Lord blessing me for doing what I know is right. I love how He works. Also with prayers: there is something really powerful about saying your prayers out loud. There’s a reason that Joseph Smiths prayer was never answered until he went and actually vocalized it to the Lord. I know that there has NEVER been a time I’ve regretted kneeling down, pouring my heart out to the Lord, crying and crying. I am so thankful for prayer. Wednesday: I got my very first sunburn on the mission <3 YAY! #truemissionary Funny thing though: I like to go to bed by like 9:59 every night and all the elders in the zone found out about this and ever since have been trying to get on my last nerve about it hahah. So almost every night this week, without fail, the elders would call about something that I would need to know but they would wait til like 10 to do it (Treadwell would be showering, unavailable to talk) and would keep me up, not telling me what I needed to know til like 10:29 JUST to keep me up because they thought it was funny. It’s funny because I would be so mad but at the same time so tired and silly that I couldn’t quit laughing the whole time. One night Elder White goes “Sister Toolan, I can’t understand Hyena!” hahahha elders love giving me a hard time. Whatevz. Thursday- We had dinner with the Woodys and the elders. Well, Elder Jopson is Asian and is actually from Northern Cali but Sister Woody walks in and goes “So elder, how are you adjusting to American food??? ?” HAHAHAHHAHA it was comedy GOLD. I love old people:) Also, there were two cats in our back yard about to get at it!! So we had to break up a cat fight…literally. Darn cats and our backyard this week….can’t escape it!! Friday: I had a really cool thing happen. As Treadwell and I started our companion study I could tell something was wrong so I asked her what was going on. She was just having a hrad time (like we all do somedays) well as I have expressed before I have a hard time being “compassionate” with my companions. I am THE most huggy person in the world but when you spend 24/7 with a person, NO JOKE, you really don’t want to touch them/be around them any more than you have too….so I’m sitting there as she is crying and the Holy Ghost prompted me to go hug her…which I did NOT want to do…but I knew it was what Heavenly Father was trying to tell me she needed. So I swallowed my pride and did it. Later she told me how much she needed it and I was really glad I was able to not only recognize but follow the prompting I had. Sunday: We had a deaf investigator come to church! It’s so great to see someone walk into church that you were hoping would come!!! Needless to say, it was a great week. I love this work. I love that I have this 18 months to be 100% focused on our Savior. I am thankful for my hard times that I’ve had so far, they have strengthened me and my testimony. Talk to yall next week!!! Johnny and I doing service! 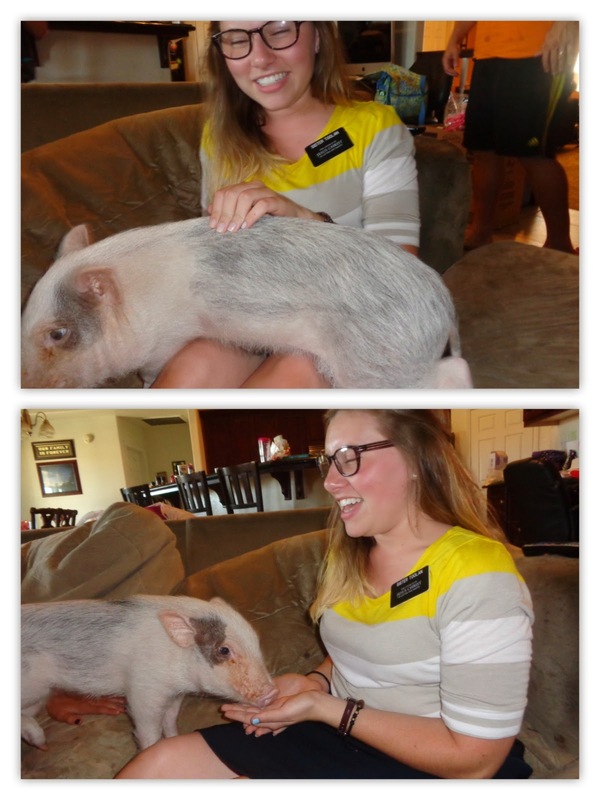 Monday- Ran into some old missionary friends while shopping which made me happy :) THEN Sister Treadwell was playing a game with all the missionaries while I was practicing piano and Sister Hicks comes in and goes “uhhh…you might want to go get your companion….” I go in there and she had run into an elder, fell down on her head and was bleeding FROM HER HEAD all over the place. I literally had to turn my “momma” side on an clean her and all her blood up, wash her hair, ice her head, all kinds of crazy stuff. I even got a liiiiiiiiitle blood on my shirt by accident -_- she looked a hot mess after it was all done and over with. 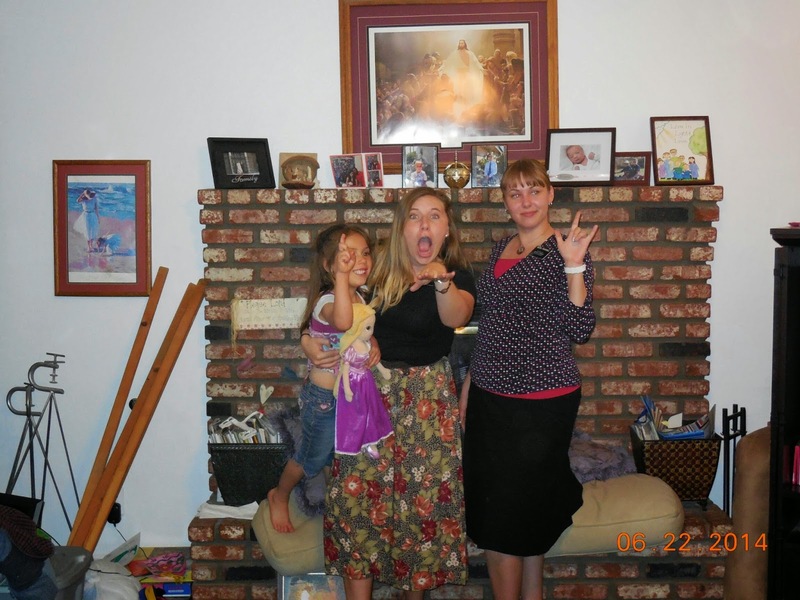 She now has a broken tailbone but hey, we are still doing missionary work and working hard! Haha. It was quite the story to tell when we had to call dinner and let them know we’d be a little late since she busted her head open hahah. Oh man. Tuesday- A girl came into the church building and I told her how pretty she was. She was probably like 14 and she goes “You have beautiful white teeth!” hahah I was like, well that’s deff not a compliment I can say I hear all the time ahaha. Thank you. Random girl at church who I don’t even know. Thank you. Wednesday- We went over and saw Ms. Robinson. She is so great. She wants to learn more about family history work and wants to start working on hers. I’ve found on the mission that working on family history work brings the spirit so strong into our lives. We met a drug dealer this day. Totally normal. We felt like crap so we treated ourselves to some icecream! It’s getting HOT UP HUR in the desert! Friday- Once again, got hit on by our waiter at this country cooking restaurant and he gave us free homemade banana bread. SCORE. Our Zone Leaders called us and asked us to give a training at Zone Meeting tomorrow. We will see how allllla thaaaat goes haha. WOODYS BAPTISM WAS AMAZING. President and Sister Hobbs ending up coming, so it was nice to see them and chat with them a while. Woody was there like 45 mins early because he was just SO excited and a ton of his family (not members) came to support him which was nice. He is so tall and the man baptizing him knees locked up on him and we were scared woody wouldn’t come back up out of the water haah which was perfect because Sis. Woody (his wife) kept joking around about how brother smith needed to hold him down as llllllllllllonnnnnnnnnnnng as possible because he needed as much purifying as possible hahah. It was a beautiful service and the spirit was so strong. Oh, we also had smores this night…first smores of the year…..awesome. Sunday- I walked out of a room at church and saw Sister Cardona…one of my very favorites! We ran up to each other and started to cry from happiness. ANOTHER tender mercy of the Lord. We meet in the same church building now which means I will be seeing her every week. How amazing. I love the friends I have made here on the mission. These people mean so much to me and we will cherish these times we’ve shared the rest of our lives. Sunday night I tried to teach Sister Treadwell to speak “Ebonics” but I failed hahah she is so white. It made for a really good laugh though. One thing that’s funny to me: I think that people (especially members) think missionaries are perfect or something. When in reality we are soooooooo far from it and we are more aware of it than ever lol. I think the tag deceives people. We are still human. We still do dumb things we shouldn’t and we still are little kids at heart. Remember that the next time you see a missionary mess up on accident, just like you do, and don’t give em a hard time. I promise you they are already beating themselves up for it anyways haha. Hesperia gets me for at least 6 more weeks! Welp, I’m staying in Hesperia….so yeah. That’s about all I have to say for now. On the bright side Sister Ott is coming up here so that will be nice to have a familiar/happy face to see every now and then! Why is this? Because we are made of the stuff of eternity. We are eternal beings, children of the Almighty God, whose name is Endless and who promises eternal blessings without number. Endings are not our destiny. I am also so very thankful for all of the tender mercies The Lord blessed me with that day. I wish I had time to write about all of them, but I don’t and that’s what post-mission life is for :) It’s just nice to know that the Lord is aware of our ever circumstance and is willing to place things/people in our paths to help ease the load we are carrying. I just love my Savior. Disclaimer from Katie's mom: It is standard procedure to have an opening prayer and a closing prayer at any given meeting (i.e. Ward potluck). The second prayer at this ward potluck was not customary but Mormons LOVE to pray....anytime! Woody is getting baptized this Saturday..June 7th….Daddys birthday :) His wife got up at church yesterday and talked about how she has known Woody for 55 years and she never thought he would EVER get baptized. This man is incredible. He has stopped drinking coffee, beer, quit smoking, SO many things just because he knows this is the pathway back to Heavenly Father. It makes me think of one of the lessons we had yesterday at church. We were talking about sacrifice and someone made the comment that “It’s never sacrifice when you get back more than you give.” So yes, Woody had to give up some things that he was used to doing, that he enjoyed doing. But in return he is getting eternal life, blessings beyond believe, a family sealing in the future, the companionship of the Holy Ghost. SO MANY THINGS. I am so proud of him. I am so thankful for the many lessons I learn from the people I get to teach out here. I am just thankful. Katie knows how much a <3 a sunset!!!! What Exactly Do "Mormons" Believe? ^^CLICK HERE TO FIND OUT. Ward: Our local congregations are called wards. They are organized geographically and members attend a ward near their home. P-Day: Preparation Day - Missionaries get one day a week to prepare for the upcoming week. Examples would include buying groceries, washing a car, laundry, emailing, letter writing, shopping, etc.